Have you ever encountered Window Firewall won’t start error code 6801? It is usually caused by misconfigured system files. If you receive this error message, it probably means that there are registry problems on your computer. To fix it quickly and effectively, you can follow the tutorial below. This method was reported effective to resolve the Windows Firewall won’t start issue. Follow the detailed guide below step by step, and you may achieve it. Step 2. Get to “c:\windows\system32\config\TxR” or the equivalent location on your computer. Step 3. Run “attrib –H –S *” command to make all hidden files in the directory visible. Step 4. Run “del *.blf” command to delete the .blf file which is used to prevent the Windows registry from becoming corrupt. Step 5. Run “del *.regtrans-ms” command to delete the .regtrans-ms file. 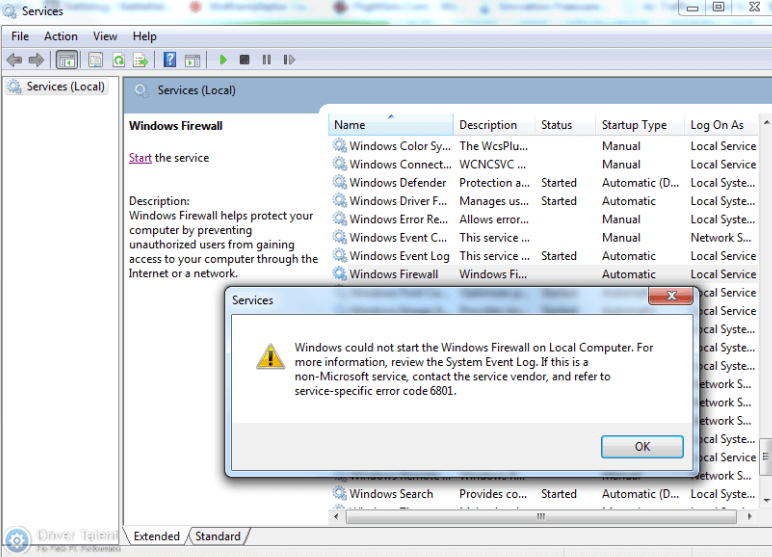 Now you can restart the Windows Firewall to see if the error code 6801 has been disappeared. If the Windows Firewall won’t start error code 6801 is still on your screen after you try the method above, feel free to leave comments below to let us know. We will try our best to help you. For more solutions to other computer issues like blue screen, black screen, reboot loop, no WiFi available and no Internet, you can click here.